This year, I decided I would wild camp at least once every month of the year. When possible to make something from wood while out there. Cook from the fire too. This to add a level of adventure and learning to my outdoor life. If I was to use the same equipment every month for this, such as a tent, mat, sleeping bag and stove, it would actually be fairly simple. I want to explore different types of shelter and minimise kit when I can to keep light and somewhat reliant on what natural resources I can find. Not survival, but comfortable overnighting with a little thought. Location: High sloping valley woodland, Clwydian Hills, North Wales. The first camp, in one of the coldest spells in January was a test of will power just to set out in in the dark, with below zero temperatures and just to get on with it. To make it a lot easier, I set up the camp while it was light at lunchtime, then hiked back up there mid-evening to get straight into the sleeping bag. This worked really well as the 30-40min uphill hike in meant I was getting into bed warm. I didn’t have a long walk in so didn’t need to be too lean with kit. Staying for the full evening would mean a significant time while it was still light gathering/processing dry firewood and taking much more clothing. I didn’t have this time to process wood with this being, through necessity, during my working week. Although the overnight temperature was looking below zero, there was little wind forecast for most of the night, so little windchill running through the fairly open sleeping setup. With more wind, a different location and a tent would have been better. Taking a hot flask was a good move. This was the best way to camp in sloping woodland. The combination of (all down); winter sleeping bag lined with a super light summer sleeping bag both in a breathable divvy bag, with a windproof underqulit under the hammock and only thin leggings/baselayer was about right. I slept ok, as good as it was going to get in a hammock/sleeping bag, pending a more winter specific tarp set up. I set the tarp up in an A-shape which wasn’t quite long enough for the hammock. It wasn’t forecast to snow overnight so this wasn’t critical but snow fell from the trees overnight. 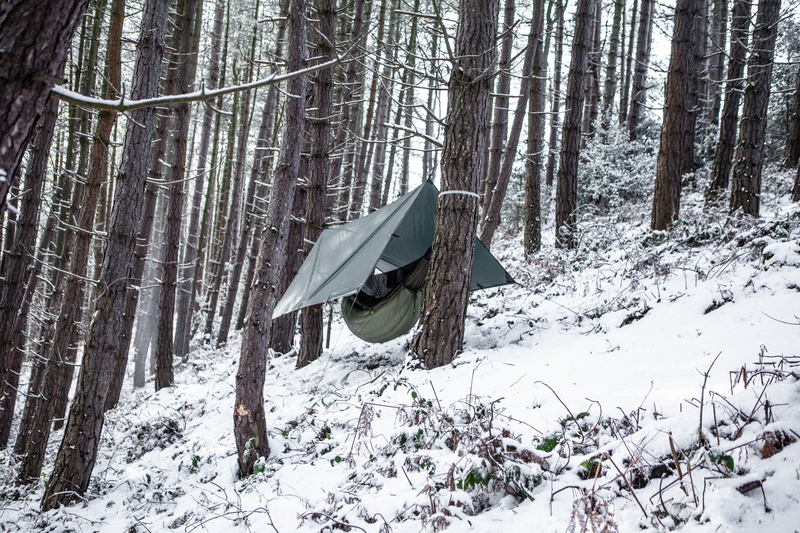 A diamond configured tarp, with the tarp ridge much closer to the hammock to keep colder air out would have been better. I needed to drop the sides of the tarp in the night to block cold air from the sides – this worked well but the sides un-pegged moved in the wind at dawn. A slightly thicker liner sleeping bag wouldn’t have hurt, especially if the temperate dropped lower or the wind got up. I wasn’t nearly kitted up for the wind chill in the morning near the top of a ridge, once out of the hammock. There was little escaping it, but a shell jacket and better gloves would have helped. It would have been dangerous to try and make a hot drink in that wind chill, so getting out quickly was the only option.